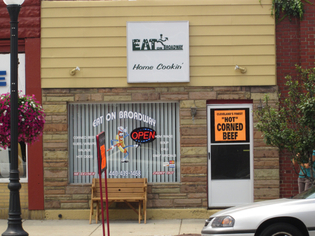 Those bright orange &apos;"Hot" Corned Beef&apos; signs are hard to miss, so I stopped by Eat on Broadway to see what they had to offer. It's a cute little restaurant, right in the middle of Bedford's downtown area (at 692 Broadway Avenue). I found easy parking, walked right in and ordered their Corned Beef sandwich (what else?!!) to go. Open about a year, they seem to be part of the revitalization that this part of Bedford is experiencing. They were doing a brisk business when I arrived and yet there was plenty of time for the banter between those on both sides of the counter. There are seats for about eight and a variety of choices for you if you're not into Corned Beef (anathema, I know). If I can find my menu, I'll scan it and post it here. As far as the sandwich goes, I'm going to have to give Janine and Larry the benefit of the doubt and presume I had an unusual, bad cut of meat. It was not lean (gristle is more like it) and I was unable to finish a portion of it. On the other hand, I saw the Corned Beef come out of the container (6.5 ounces, I was told at the time) and perhaps it could have been caught at that point. I'll just have to come back again and try another one! I'll let you know how that goes. 6/29/2010 - Update: Here's a scan of the Eat on Broadway Menu in PDF. While asking permission to take a picture at a Corned Beef site, I was asked "Why, are you planning on opening a restaurant?" Of course the answer was "no", but I felt like I owed a further explanation. Like who I was and why I was taking these pictures. So, believing that honesty is the best policy, I explained that I'm one of the writers* over at Best Corned Beef in Cleveland dot com and that I'd be posting something later this week. And that got me to thinking. When I was anonymous, no one would ever think of giving me free stuff to influence my writing. But they might if they knew I was going to review them. 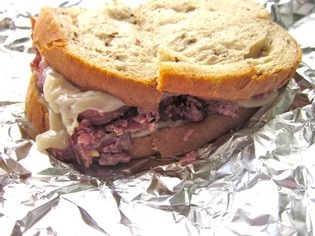 I'm passionate about Corned Beef. I like to smell it, I like to squish it between two pieces of bread, I like to write about it and above all those, I like to eat it. I'm not a professional food critic. This is a hobby. Writers* at Best Corned Beef in Cleveland are expressing their opinions. If we figure out a way to objectively provide repeatable, unbiased ratings for Corned Beef, we'll be sure to let you know. 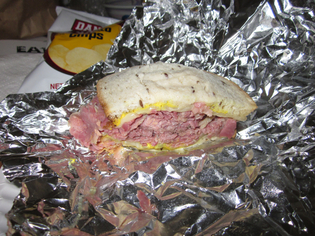 Writers* at Best Corned Beef in Cleveland are not paid for their work, nor are they compensated with free food. It hasn't happened yet (6/24/2010), but if a restaurant offers free or discounted food, we will insist on paying full price. If this is not acceptable to the restaurant, then we will walk away. Sadly. Hungrily. We'll be open, honest and transparent with you, the readers and them, the brisket bakers. That doesn't always mean I'll show up at their restaurant with my Best Corned Beef in Cleveland business card, but I won't evade any questions, either. *Regarding "Writers": Three people signed up for this project. Currently, two of them are slackers. I've either lived in or had a business concern in Bedford since 1995 and all that time I've never had a chance to set foot into The Doghouse until yesterday. I say "set foot" since it's kinda hard to get both in at the same time. The place is really small and parking is somewhat limited (I had to wait for one car to leave before I could slip in.) 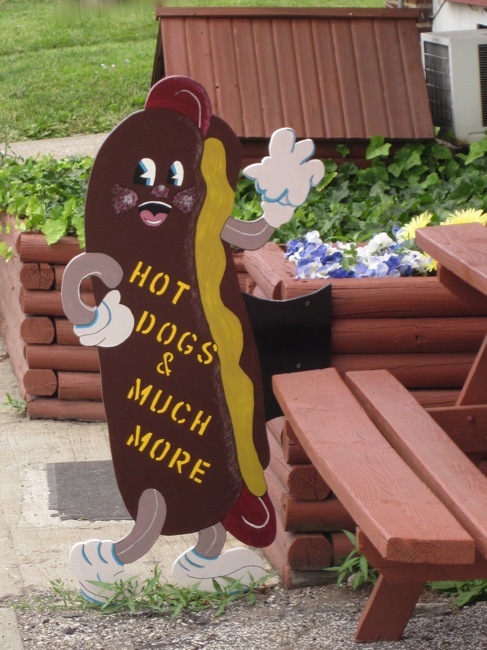 but if you're cruising the Bedford Automile and need a bite to eat, this place is worth a try. 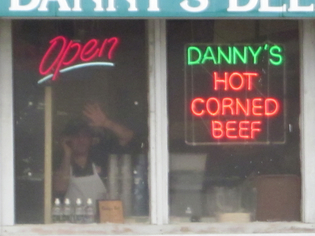 I have no idea about the rest of his menu, but the guy (and gal) behind the corner both know a thing or two about Corned Beef. I learned that I was the sixth person to get a sandwich that day when they explained that I would get the end (and last of) the brisket. (The brisket started out serving sandwiches on Saturday.) They'd just have to cook some more for the next day. 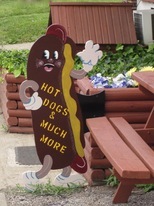 I had always assumed that little places like this bought theirs pre-cooked, but that's just not the case. Since mine was the "heel" and I'd get what was left, he knocked a dollar off the $5.95 price (plus $.25 for cheese). So for $6.20, you can expect a decent-sized sandwich, swiss cheese, a deli pickle (or two) and a small bag of chips. I'd like to see what a full-sized sandwich looks like before I get too excited about the cost/value side of things, but the corned beef was excellent. The slices I got were lean, crumbly and delicious. My wife wanted to know more about the place when I told her about the trip. I think the thing she laughed about the most was when I told her about the menu sign. The place is so small and the whiteboard menu is so big and so close to you, that you kinda have to put your head on the wall and crane your neck up to see the top. Seriously, it's only probably three feet from your nose but it's a big (4' by 6'?) whiteboard! 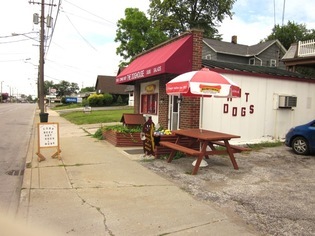 The Doghouse can be found in Bedford, a few miles south of the AutoMile at 589 Broadway, north of downtown and south of Broadway/East Grace. You can call them at 440.786.2260 or just drive over and grab one! I'll be heading back to see what the start of the brisket tastes like and see what a full sandwich looks like. 6/22/2010 - Update: I went back for lunch today and had the fresh brisket that was prepared last night. 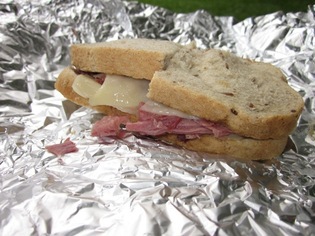 No real change in the quality—still the same lean, delicious Corned Beef—just a lot more of it! While I was there, I learned that this has been a restaurant only since 2002; prior to that, it was a barber shop. 6/29/2010 - Update: Here's a scan of The Doghouse menu in PDF. We had an errand to St. Clair this week to the West Marine there for fresh flares since ours expire this month and we intend to do some Lake Erie sailing. 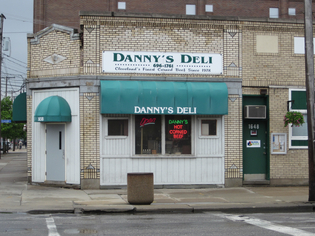 For some silly reason, I'd never figured out just how close that store is to Danny's Deli. It was too early for a sit-down lunch, but it wasn't too early for a take-out lunch and so I asked my entourage (never run errands without your children) what they thought. I have an adventurous three year-old and a bold seven year-old and so of course the answer was yes. I called to make certain they were open and we walked the two-thirds of a block and crossed the street. We ordered a pound of Corned Beef, cookies for three, paid for our purchases and headed back West Marine where we left the car. I'm not sure who was more excited, but perhaps the children were. I never did get any pictures taken. That pound fed all six of us and the only things left were a couple of pickles. I guess I'll just have to get two pounds next time!